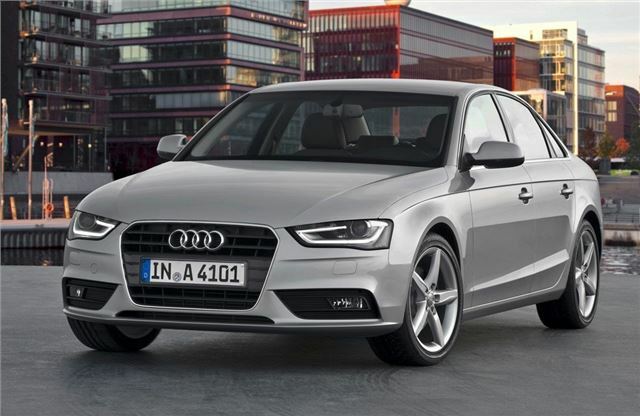 Audi has announced prices for the revised Audi A4 range, which is now available to order with the first cars arriving in March 2012. The popular A4 range gets a range of improvements including subtle styling updates, new interior colour schemes and more efficient engines. List prices have increased by £200 over the outgoing models which means that prices will start at less than £24,000 for the entry-level 1.8 TFSI with 120PS - although this model won't actually be available to order until early 2012. The popular 2.0 TDI 177PS six-speed manual version is priced at £27,575 while the most economical model - the 2.0 TDIe with 136PS, is £26,555. All the engines are now fitted with an engine start/stop system that has improved fuel economy by more than 10 per cent on average. The 3.2-litre V6 petrol has been dropped from the range so the top petrol is now the 2.0 TFSI with 211PS that's available with quattro four-wheel drive. It's the TDI diesel engine which most people choose though and there are now two 'green' models, badged TDIe. The first is the 2.0 TDIe with 136PS which returns an impressive claimed economy of 65.7mpg while CO2 emissions are just 112g/km - astonishingly low for a saloon car this size. The more powerful 2.0 TDIe with 163PS isn't that far behind and returns a claimed 64.2mpg with a CO2 figure of 115g/km. The 2.7 TDI has been dropped and replaced with a 3.0 TDI with 204PS that was first used in the A6 Saloon and A7 Sportback. It averages a claimed 57.6mpg which is very frugal for a V6 diesel. A more powerful 245PS version is linked exclusively to quattro all-wheel-drive in Saloon, Avant and allroad quattro variants. Elsewhere, the suspension has been fine tuned with new rear control arms and revised shock absorbers plus the A4 now comes with electromechanical power steering. It has direct gear ratios designed to be more precise plus it draws no power from the engine when running in the straight-ahead position, improving fuel economy and reducing CO2 emissions by up to 7g/km according to Audi. As before the trim levels include the SE Technik, which costs an extra £1100 over the standard car, while the top S line specification will set you back £2555. The great looking Black Edition models are still available too with a £1250 premium.